This is the best secrets to creating more and more backlinks and get much web traffic on your posts or website. One of the best and most handsome methods to boost your page traffic to complete your goal. So let’s find the correct methods to get quality backlinks. 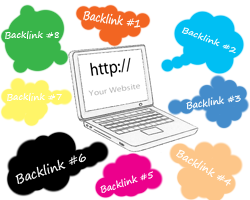 Backlink is a web URL incoming link that is connected to web pages each other’s, backlinks are highly important to page rank as Google Page Rank rates them highly. So backlinks in very good in order to generate the ranking and also boost your site traffic and content. Quality of backlinks is important because 1 quality link are beaten 100 bad ones and Google ranking. And you must look visibility of good backlinks every time. People will have to see it and decide to link to it in order to add more value to their site or blog. 1st of the good way to start and creating backlinks is by writing a good posts, you use images, grapes, and post related video clips, to make your post interesting. It will need to be from 1100 to 1300 world long. And write your post information really need to users to be good and make your post interesting. And if you can really hit the details so that people will fully understand and learn how to do what you are explaining to write in posts. Another best way to help the word and increase your backlinks is e-books you also send you links to the best in social media like a Facebook, twitter, social bookmarking sites as well to help augment your efforts. So write e-books you don’t have to write many posts, but just create one that's very useful and interesting and shared so that you can build high quality backlinks. Special days are another interesting way to build your backlinks. Just target special days on your posts, like a big event, Christmas, Halloween, and Valentine’s Day and also attached some links to offer discounts some products or any services, with free offers. And everyone like this and share, so that is an easy and good way to get high quality backlinks to your website blog. The biggest marketing tool now a day is YouTube, you just create some interesting, funny, video clips to start getting great backlinks. If people like your video they will must share it with their friends or family. And you get a good backlinks response via YouTube Network. These above methods you can use to build high quality backlinks and start rank up your web, blog traffic. If you have any concern about this topic don’t hesitate to leave your comments in below this post. :) Have a nice time bye bye. You have shared how to create free quality back link way.Thanks for your nice quality full back links sharing.If you want to know social media marketing services please check my page.